If you're on a detox diet, then you're trying to eliminate potentially harmful chemicals and junk foods. The following recipes are free of processed foods, chemicals like caffeine and preservatives, pesticides, alcohol, sugar and artificial sweeteners, common allergens like wheat and dairy, industrial seed oils, and other potentially harmful substances. Instead, they contain healthy, whole foods consisting of organic fruits and vegetables, healthy whole grains, and pastured animal proteins. Get a healthy start to your day with these chemical-free breakfasts. 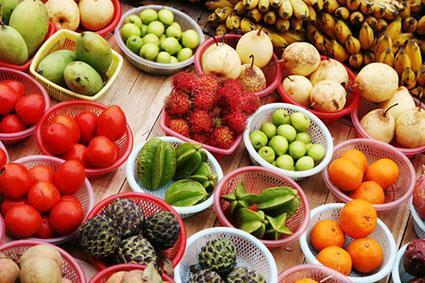 Organic fruits and healthy greens nourish your body, keeping toxins away. The chia seeds add healthy omega-3 fatty acids, while the fiber in the smoothie helps your body excrete toxins. A dash of cinnamon and cayenne speeds up the detox process. 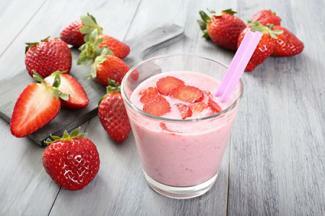 This smoothie is also dairy-free and grain-free. Serving size is 1 cup, and the recipe serves 4. You can refrigerate leftovers for up to three days. 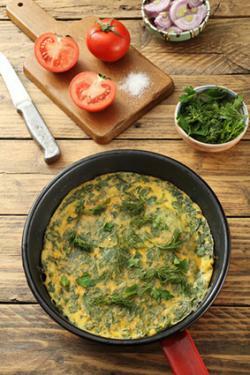 Loaded with healthy organic veggies, this frittata is a great way to start your morning. Use organic, pastured eggs and choose organic veggies. The recipe is high in cleansing fiber as well as vitamins and nutrients, and it's finished with a drizzle of healthy extra-virgin organic olive oil. The recipe is gluten-free and dairy free. It has a pinch of cayenne to help speed up the detox process. It yields four servings, which will keep tightly sealed in the refrigerator for up to three days. Preheat your broiler on high heat. In a large bowl, whisk together the eggs, cayenne, sea salt, thyme, and mustard powder. Set aside. In a 12-inch oven-proof saute pan, heat the olive oil on medium-high until it shimmers, coating the entire bottom of the pan. Add the shallots and kale and cook, stirring occasionally, until softened, about five minutes. Add the mushrooms and cook, stirring occasionally, for two more minutes. Carefully pour the egg mixture over the vegetables. Cook without stirring, allowing the eggs to set around the edges. Transfer the pan to under the broiler, cooking until the top is lightly browned and puffed, three to five minutes. Top with the sliced tomatoes and drizzle with olive oil. Cut into four slices and serve. 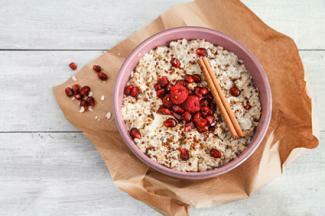 Quinoa is a great detox grain. It's high in fiber and protein, and it doesn't contain gluten. This breakfast is a warm, tasty start to the day. It's vegan, dairy-free, soy-free, chemical-free, gluten-free, and sugar-free, making it perfect for detoxers. Cinnamon helps speed detoxification. Because you make it in a slow cooker, it's super easy to toss in the ingredients the night before and wake up to a warming, satisfying breakfast. The recipe keeps well tightly sealed in the refrigerator for up to three days. Serving size is 1 cup, and it serves 4. In a colander, rinse the quinoa under running water. In a slow cooker, combine all ingredients except the pomegranate seeds. Light, organic lunches provide energy mid-day to keep you feeling great. Making lunches ahead of time and packing them to take with you to work or as you go about your day makes it easier to stick to your diet. Wild-caught Pacific Salmon is high in healthy omega-3 fatty acids and serves as an excellent source of protein. Homemade mayo flavored with orange zest, garlic, and pepper flakes adds a bit of sweet, a bit of spice, and a creamy texture along with the healthy fats found in olive oil. The heat in the pepper flakes can assist in detoxification, and apple cider vinegar is also detoxifying. The lettuce wraps have the perfect amount of protein to keep you going throughout a busy afternoon. To take it with you, carry the salmon salad and lettuce separately, then put it together in a wrap before you eat it. The recipe serves four. Sprinkle the salmon with 1/2 teaspoon of the salt and the pepper. Lightly oil a grill set on medium-high. Grill the salmon, skin-side up, for about six minutes, until the salmon releases from the grill (it doesn't stick). Flip the salmon. Continue cooking on the skin side down until the salmon is opaque, another three to four minutes. Allow the salmon to cool completely, and then remove the skin. In a food processor, combine the orange juice and zest, garlic, apple cider vinegar, red pepper flakes, grated ginger, mustard powder, and egg yolks. Turn the food processor on high, running for about 30 seconds to thoroughly chop the garlic. Now, add the olive oil through the chute in the processor with it still running. Start with just a drop at a time. After about 10 drops, add it in a thin stream. If your food processor chute has a small hole in it, you can drizzle it through the hole in the chute. Turn the food processor off when the olive oil has all been added. The consistency should be thick - this is a mayonnaise. Flake the cooled salmon into a bowl. Add the grated carrots, scallions, and cilantro. Stir to combine. 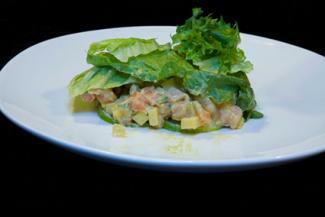 Serve the salad scooped into the lettuce leaves. 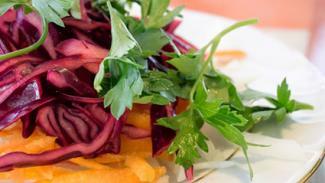 This vegan option is gluten-free, dairy-free, and loaded with organic, detoxifying vegetables. Be sure to use an organic vegetable broth and read the label to ensure no artificial ingredients are included. Or, make your own vegetable broth so you can ensure it is made from only the healthiest ingredients. 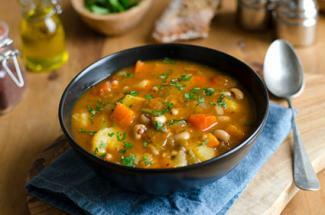 Hot soups can help induce sweating, which will aid in the detox process, and the soup has a pinch of cayenne to make it even more warming. The recipe serves 8 and it freezes well. Add the onion and cook, stirring occasionally, until soft, about five minutes. Add the garlic and cook, stirring constantly, until fragrant, about 30 seconds). Bring to a simmer and reduce heat to medium-low. Cook until the vegetables are soft, about 15 minutes. This vegetarian dish is full of clean food options including healthy veggies and a tasty homemade vinaigrette. It's high in vitamins, minerals, and fiber, and the lemon juice and apple cider vinegar in the vinaigrette can help speed detoxification. Leave out the eggs to make it vegan, or add some pastured chicken for additional protein. The recipe serves four. In a large bowl, combine the kale, spinach, radicchio, carrots, eggs, cranberries, and pecans. In a small bowl, whisk together the lemon juice, apple cider vinegar, garlic cloves, mustard powder, sea salt, black pepper, and olive oil. Toss the vinaigrette with the salad just before serving, or serve it on the side for drizzling. Dinners are light, full of flavor, and satisfying. They are also free of toxic chemicals and contain high nutrition foods. Traditional Asian flavors like garlic and ginger are excellent detox ingredients. This meal is grain-free, gluten-free, dairy-free, and chemical-free, so it is the perfect support for your detox diet. It serves four. In a small bowl, whisk together the juice of two limes, three of the garlic cloves, the soy sauce, the red pepper flakes, one tablespoon of the grated ginger, and 1/2 cup of the olive oil. In a gallon zipper bag, combine the tenderloin with the marinade, squishing the bag to coat. Refrigerate and marinate for at least three hours and up to eight hours. In a large saute pan, heat two tablespoons of the olive oil on medium-high until it shimmers. Remove the tenderloin from the marinade and pat it dry with paper towels. Discard the marinade. Sear the tenderloin until it is brown on all sides, about four minutes per side. Put the tenderloin in a roasting pan and roast until it reaches an internal temperature of 145 degrees Fahrenheit, about 15 minutes. Allow to rest, tented with foil, for 10 minutes. While the tenderloin rests, in a large bowl combine the cabbage, jicama, apple, scallions, carrots, and cilantro. In a small bowl, whisk together the remaining juice of one lime, three garlic cloves, 1 tablespoon of ginger, half cup of olive oil, the salt, the mustard powder, and the apple cider vinegar. 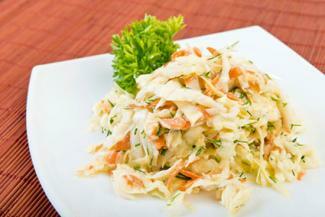 Toss the vinaigrette with the cabbage mixture. Slice the tenderloin and serve it on top of the slaw. 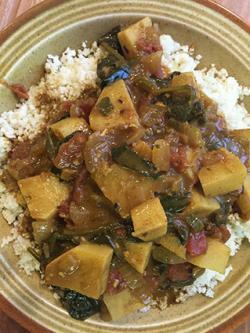 This vegan option is full of fragrant curry spices, which are all quite detoxifying. It's also high in fiber, nutritionally dense (that is, it has lots of vitamins and minerals), and it is grain-free, dairy-free, and gluten-free. It serves 6. In a large pot, heat two tablespoons of the olive oil on medium-high until it shimmers. Add the onion and jalapeno and cook, stirring occasionally, until vegetables are soft and begin to brown, about five minutes. Add the cinnamon, cumin, turmeric, coriander, cloves, ginger, and salt. Cook, stirring constantly, for one minute. Add the sweet potatoes, spinach, coconut milk, chicken broth, and tomatoes. Bring to a simmer, stirring frequently, and reduce the heat to medium-low. Simmer, stirring occasionally, until the sweet potatoes are soft, 20 to 30 minutes. While the curry simmers, break the cauliflower into florets and pulse them in a food processor for 10 to 20 one-second pulses until it resembles rice. In a large saute pan, heat the remaining 2 tablespoons of olive oil on medium-high until it shimmers. Add the cauliflower and cook, stirring frequently, until it is soft, about four minutes. Serve the curry over the cauliflower. Having healthy, detoxifying snacks throughout the day can help keep you on plan. 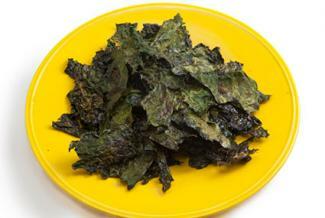 Kale chips have a light crunch and a savory flavor. You can make basic kale chips, or use the recipe below for a spicy version. Kale is nutritionally dense to provide nutrition during your detox, while spicy chilies can speed up your metabolism and enhance detoxification. The chips keep in your cupboard sealed in a zipper bag for up to five days and yield six servings. Preheat your oven to 350 degrees Fahrenheit and line a baking sheet with parchment. In a large bowl, toss the kale with the olive oil, sea salt, chipotle powder, and lime zest until kale is well coated. In a single layer (you may need to work in batches), put the kale on the prepared baking sheet. Bake in the preheated oven until the kale dries and is crisp, 10 to 12 minutes. Since you're skipping sugars of all kind right now (including natural sugars like maple syrup and honey), then fruit is your go-to if you're looking for a little sweetness. The ginger, cinnamon, and cayenne also enhance detoxification. These sweet-tart apples will give you a taste of dessert without breaking your detox. The recipe serves 4. Remove the stem and core from the apple, using a spoon to scoop out a hole about three-quarters of an inch in diameter in the center of the apple. Leave the bottom of the apple intact so the apple serves as a type of a bowl. In a food processor, combine the coconut oil, pecans, orange juice and zest, cinnamon, ginger, cayenne, and salt. Pulse for ten one-second pulses, or until it resembles a sandy meal. Spoon the mixture into the center of the apples. Put the apples in a baking dish, cut-side up. Bake in the preheated oven until the apples are soft, 15 to 20 minutes. Eating a detox diet doesn't have to leave you feeling deprived. By using whole, organic, natural foods you'll be well on your way to a body with fewer toxic chemicals.